Ram Truck has started production of the dual fuel Ram 2500 CNG truck and announced that it will be available for retail consumers as well as fleets. 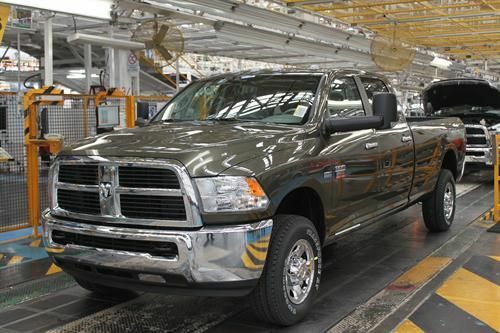 The first production model 2013 Ram 2500 Compressed Natural Gas pickup truck rolled off the line Tuesday at Ram Truck's Satillo Truck Assembly Plant in Mexico. The CNG trucks are part of Ram's line of medium- and heavy-duty pickups available to commercial fleets as dual-fuel (gasoline - CNG) vehicles. Ram has also announced, coinciding with the start of production on the 2500 CNG, that these trucks will now be available to retail consumers interested in a gasoline-CNG hybrid option to maximize efficiency. The Ram 2500 CNG is the only original manufacturer-built compressed natural gas pickup truck in North America - all others on the market are after-factory retrofits. When switching between natural gas and gasoline, the truck sees little difference in capability and operation, making it seamless for the driver. When CNG tanks are emptied, the trucks automatically switch to their gasoline tanks until the CNG tanks are refilled. For people who live near CNG infrastructure, the natural gas option means much lower fuel costs and big emissions benefits thanks to the availability of this abundant, locally-sourced fuel. CNG has lower greenhouse gas and smog-producing pollutants - up to 90% less than gasoline. Mileage figures (gasoline-equivalent miles per gallon) are roughly the same for CNG vs. gasoline in the Ram 2500 CNG, but fuel costs are 30-50% lower than gasoline per gallon equivalent. The Ram 2500 CNG can be ordered through dealerships now and is expected to begin arriving on select showroom floors in mid-December and early January. Finally one of the big three was smart enough to start producing natural gas powered trucks. Now how about doing the same with SUV's!!! just my 2 cents. IF sales can pick up enough and infrastructure for public fueling grows enough to justify it, you'll see it. I think that Detroit learned its lesson with jumping on the bandwagon too early with alternatives in trucks, though. Hybrid trucks and SUVs have been poor sellers and money losers, which is why many are being dropped in favor of high-efficiency gasoline-only engines instead. There's a reason Flex-Fuel vehicles are selling so well in comparison.